Customer service is a priority at Tentaroo. Our clients gave us a 9.2/10 rating! Clients who had a previous vendor gave it a 4/10 rating on customer service. Managing events and camp properties can take some effort - but we're here for you. We believe that a solid system that just makes sense, combined with attentive, available support can help you to take your camp to the next level. Tentaroo's platform makes it easy to update our website and keep our Scouting families informed. I love the photo options and page design but most of all the incredible customer service. Enrique and Moishe go the extra mile to ensure the system is supporting our special events. Help is always a click or call away. THANK YOU TENTAROO! 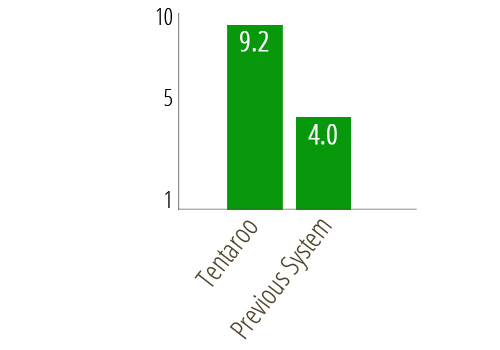 There is not enough space on the page to articulate how much Tentaroo has changed our customer service experience. It has streamlined our website and event sign ups, making them all uniform and in a stylish and easy to read design. . It has created an incredibly easy summer camp registration experience for us this year as well. In particular, the drag and drop class selection, the flexibility in creating classes and the waiting list feature has made this so seamless. There is a great selection of useful reports and ability to look have historical data for comparison. We love that blue cards can be printed and that class completions will be stored for units to refer to. The ability to send messages and invoices within an event is outstanding - a huge time saver and a wonderfully convenient way to communicate details to the group. The one thing that exceptionally stands out with Tentaroo is the customer service they provide us. No question is too minor and they are prompt in answering all questions and exceptionally helpful and patient. The training was thorough and ongoing. The webinars have been super helpful. Overall, we could not be more pleased with our decision with moving to Tentaroo and are looking forward to future innovations! Just wanted to let you know that I am really impressed with the way the CRK (Camp Raven Knob) Tentaroo registration system is working. Getting the class scheduling and camp rosters together for each week is a complicated task, but your system makes it really easy. A lot of work went into it and it shows. I hope others are recognizing your accomplishment as well. Tentaroo has helped transition our online registration to a new level. Our units really enjoy being able to select the schedules and confirm them at check out. It's also very beneficial that Tentaroo shows the available number of seats left so units know how many seats are available. The guys are extremely easy to work with and help us out when we have issues, questions, or concerns.